From left to right: Chad Burke, President & CEO, Economic Alliance Houston Port Region; Barry Klein, General Manager, Shell Deer Park; Claudia Vasquez, Sr. VP and Chief Program Officer, Neighborhood Centers Inc.; Peter Beard, Sr. VP, Greater Houston Partnership; Nicolas D’Antonio, Program Manager, Manufacturing Institute. 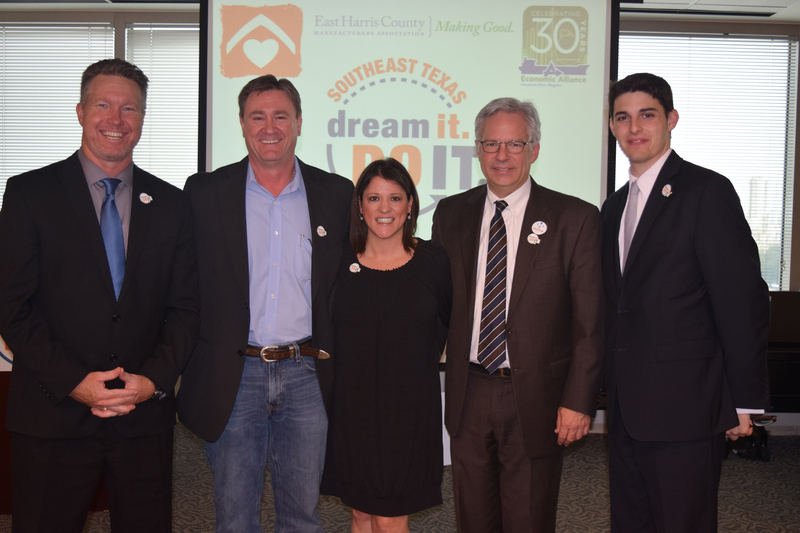 Southeast Texas joins national effort to change the image of manufacturing for youth. The Manufacturing Institute is pleased to welcome the Economic Alliance Houston Port Region as the newest member of the Dream It. Do It. network representing Dream It. Do It. Southeast Texas. With their new membership, Dream It. Do It. has expanded its network to 35 programs in 34 states, reaching 365,000 students. Dream It. Do It. Southeast Texas is also supported by Neighborhood Centers, Inc., the largest charitable organization in Texas focused on strengthening neighborhoods in the Houston area. “It’s about connecting our neighbors to opportunity and moving our hardworking families up the economic ladder with better jobs and higher wages,” Neighborhood Centers Senior Vice President and Chief Program Officer, Claudia Vasquez said of the partnership. In addition, Sandvik Coromant will support the program through sponsorship of its first Young Manufacturers Summer Academy this year, which introduces students to advanced manufacturing through hands-on activities and simulation-based learning, travel to industry locations for on-site interaction with manufacturers, and a mock career fair capstone event. “Raising awareness for the opportunities a career in Manufacturing can offer and creating real world experiences for students to explore this industry first hand are two of our top priorities in securing a skilled future workforce,” says Brian Flores, senior manager Branding and Education, Sandvik Coromant. The Dream It. Do It. Southeast Texas kickoff event was hosted at Shell Deer Park’s administrative building and included remarks by Barry Klein, General Manager for Shell Deer Park; Chad Burke, President/CEO for the Economic Alliance; Claudia Vasquez, Senior VP for Neighborhood Centers; and Nick D’Antonio, Program Manager for the Manufacturing Institute. Michele Hundley, VP of Public Affairs for the Economic Alliance, moderated a Q & A for attendees to delve deeper into the program’s logistics. Several students from San Jacinto Community College were in attendance with resumes in hand; a testament to the fact that the program is already hard at work making vital connections between potential employees and the employers they aspire to work for. Dream It. Do It. Southeast Texas acts as the grassroots authority on influencing the perception of manufacturing careers by leveraging local, regional and statewide strategic partnerships to attract and recruit the next generation of the manufacturing workforce. Organizations interested in learning more about this effort may visit www.dreamitdoittx.org.